In my family, exercise is a way of life. But rather than workout at a gym we workout at home using workout DVDs. 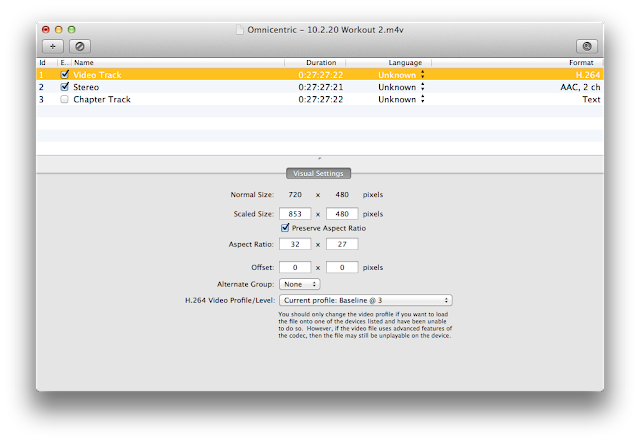 Since DVDs are so cumbersome to deal with I usually rip the DVD and use AppleTV to stream the workout to our TV. It's much easier to pick the workout you want and you don't have to paw through dozens of DVDs trying to find the right one. The challenge here is that most workouts you buy don't have chapters. That sounds like no big deal until you have a workout manic like my daughter who likes to repeat parts of a workout to make sure she breaks a sweat. So this post is dedicated to her so she can add her own chapter markers and really get a good sweat going. People other than the workout obsessed may need to add chapters as well. Adding chapters to a home movie makes it easier to find the section you want to show. Adding chapters to TV shows you record can make playback more enjoyable. Whatever your need, adding chapters to videos is easy to do. The first thing you need is a video file. 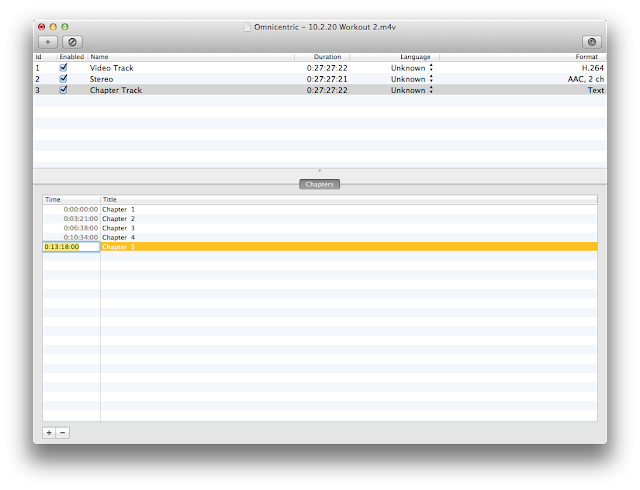 If you need to rip a DVD, Handbrake is the easiest to use. You can read about how to do it here or here. After you have a file, the easiest way to add chapters is to use a free application called Subler. Subler is a Mac OS X application that opens video files, allows you to add or remove media tracks inside them, and then saves them out again. 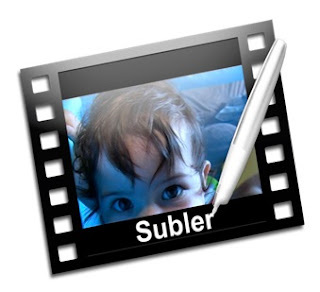 In the specialized language of the video world, Subler is a "transcoder" or "muxer." It's an application dedicated to creating MPEG4 files (.m4v, .mp4) for Apple's iDevices. Subler's original purpose was to allow you to easily add subtitles to your video files, and thus the name "subler". In time, new features were added to help Subler solve similar common problems. For instance, with Subler you can open an existing media file, add chapter titles, remove an unwanted commentary track, tag the file with season and episode information, and then save it back out again. Remux video, audio, chapters, subtitles and closed captions tracks from mov, mp4 and mkv. Add a subtitle track. Add tx3g subtitles tracks, compatible with all Apple's devices (iPod, AppleTV, iPhone, QuickTime). Today I'm only going to cover how to add chapters to a .mp4, .m4v or other video file. Download and start Subler and then open the video file you want to edit. You should see a screen that looks like the one below giving you the basic information of your file. To add chapters you can do it a couple ways. If you want uniform chapter markers go to the "Edit" menu and use the pull down menu. 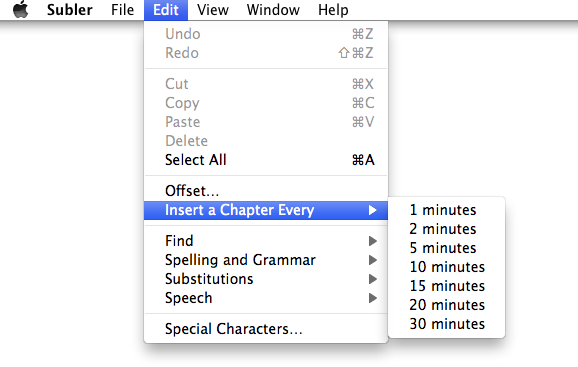 You can add chapters every 1 min through every 30 min. You can also add chapters manually. This is probably the better choice because you can add a chapter at a natural break point in the video. To add chapters manually select the "Chapter Track" line, click the box to make sure it's selected and use the "+" at the bottom of the window to insert a track. You can now edit the time and the name to the values you want. When you are done you just save the file. I recommend saving under a new name just in case you need to re-edit the file. Once you save you are done! 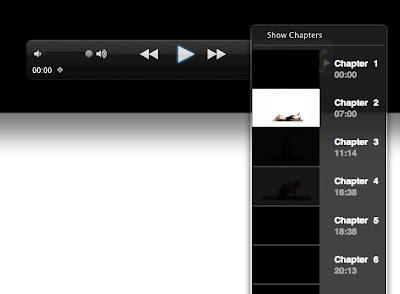 If you open the file in iTunes or play it in Quicktime you will see that there are chapter markers. If you want to burn a DVD of the file you can use Apple Burn or Roxio Toast and it will retain the chapters. Is there any way to give the chapters names instead of numbers? For example, if I have a video, already chapterized, of my family's trip to the zoo. The problem is that when viewing it on my Apple TV, I can only select the chapters by numbers. Is there any way the chapters can have names like "Giraffe" and "Lion" and such? You can name your chapters anything you want. In the example above I used "Chapter 1, Chapter 2, etc. " There's nothing stopping you from typing in anything in the text field. In my family they would skip over any chapter with a title of "Bird Eating Spider." Just click on the chapter title you want to change and it should highlight and allow you to edit. Thank you for this tutorial, I knew and used Subler when converting mkv but this is also great. However, you may be interested to know that if you only wnat one chapter, you can't have it, you have to have one at 0:00:00:00 other wise, no matter what time you set your chapter at i will also start a the beginning. Also, having only one chapter at a time other than 0:00:00:00 screws up the file with most players. I'm not sure which version of Subler you are using but the key to having the chapter show up is in the first screen shot above. You need to check the "Chapter Track" box then you can add the time you want the chapters to start. I had the same problem in that my mp4 file had no chapter track. To get around it, I used 'Edit->Add Chapter at beginning' and the chapter line will appear. After that, I selected it and added chapter points manually and it worked perfectly.